LINDSAY – A few months ago a new game idea came to the attention of the McDermont X in Lindsay. Carter Ashcraft went to a camp in Utah with his family, and while there, one of the activities he experienced was a game called archery tag. When the family returned, the facility heard the stories and began to set in motion to purchase the game, and include it at McDermont. 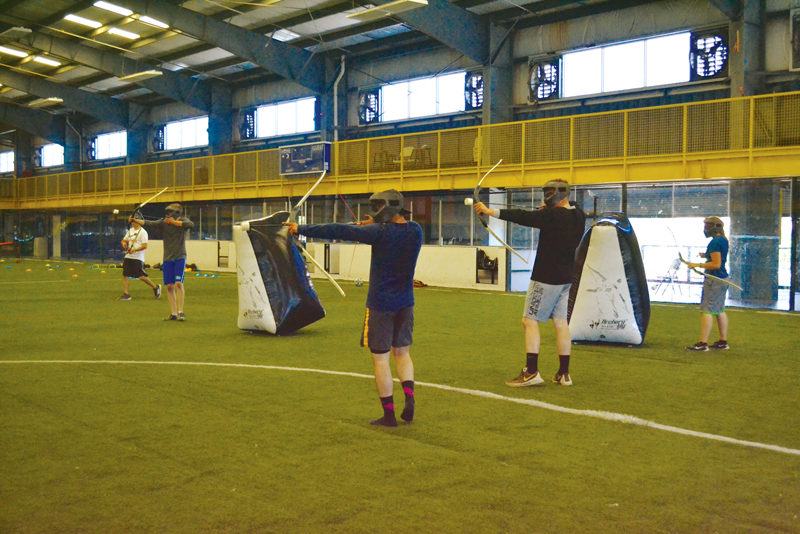 Archery tag is the newest attraction at the McDermont Field House and pits players against each other in a game with aspects from archery and dodgeball. Photo by Patrick Dillon. The game itself is a cross between dodge ball and archery. The game is divided into two 4-minute halves and comprised of two teams with four to six players on each. At the end of each half, teams switch sides. Each team lines up at each end of a playing field which has inflatable objects known as “bunkers” placed throughout. The arrows which have a foam tip on them are placed an equal distance from each team on the ground in the middle of field. Once the game starts, the players run toward the middle to grab as many arrows as they can without crossing over. All players must wear a facemask. Once the game has begun the objective is simple, score as more points than the other team. A player scores a point when an arrow hits any part of an opposing player’s body or their bow. After they are hit they must exit the field, but they are not permanently out. An eliminated player may re-enter the game if one of their teammates catches an arrow, and the player who shot it is out. If there are still players remaining at the end of the half, points are tallied up for that half. A sudden death playoff is required if the teams are tied at the end of the game. The fact that this game has no heavy equipment, and can be placed anywhere around the field house’s huge facility by one person was a selling point. Each of the bunkers are filled with air and be either transported inflated or deflated and then re-inflated once placed on the playing field. The facility has used the far side of the basketball courts, and the lower and upper soccer fields. “We have a huge facility and the flexibility to set it up and take down anywhere really caught our eye,” Velasco said. Since first offering the game McDermont has seen multiple groups and individuals return to play more games. 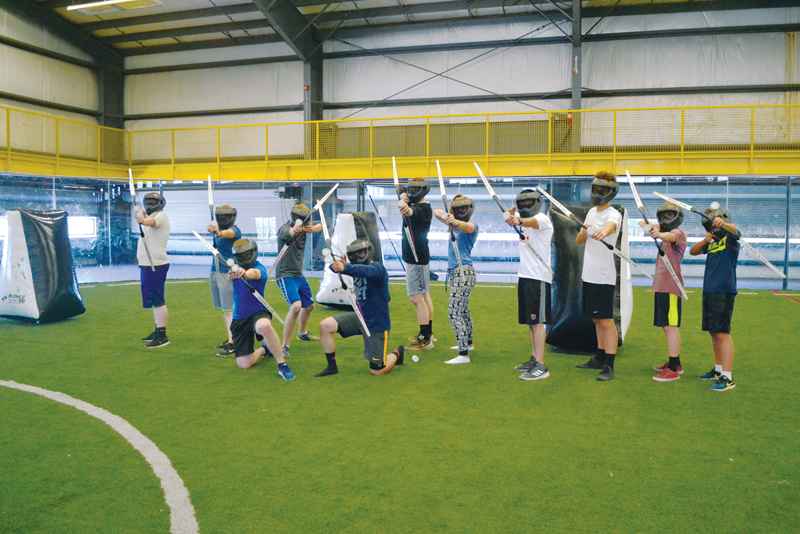 Archery tag is available on Fridays from 6 to 9 p.m. and on Saturdays from 1 to 5 p.m. The game is more suited for junior high school students and older due to the size of the bow. A time slot is $7. In the couple of months since McDermont has offered archery tag they have discovered something. Despite the emergence of bow wielding characters in movies and on television, many people are not familiar with archery. The facility has now begun offering tutorials before each game. “We probably get ninety to ninety-five percent of people who have never held a bow in their lives,” Velasco said. The attraction is still new to the facility, but the coming months might see an expansion of it. As it gets cooler, McDermont hopes to offer it more days once they get back up to normal operating hours. Tournaments and other full day events are in the works as well.